Why should you buy engagement rings wholesale? The major benefit of purchasing diamond engagement rings wholesale is the huge savings, which can be anywhere from 50-70% off the regular retail price! Unlike regular "big box" jewelry stores, buying engagement rings wholesale means that there is essentially no marked up prices. Instead, our customers are able to buy directly from us at wholesale prices and receive the same great, if not better, quality diamond engagement rings without experiencing sticker shock from a costly retailer. Because most major jewelry retailers have an abundance of expenses to cover (including marketing, advertising, large storefront, sizeable staff, etc. ), these stores must sell their products with a high markup value to compensate for all of their excessive expenditures. In other words, their very own customers are paying for all of their advertising and overhead costs. At Inter-Continental Jewelers, we do not possess the vast expenses that a mainstream jewelry store would as we are a local mom-and-pop establishment. We are able to keep all of our costs low as we manufacture our own jewelry locally in Houston, TX. We are able to cut out the middle man from the process and pass on the great savings to our customers, while receiving even greater quality merchandise as we adhere to very strict quality control standards. In addition, all of our prices are currently displayed online as we are an online retail store, and we offer competitive Internet pricing. Being honest and transparent with our customers is important to us. Very few jewelry stores display their prices online. We are an online retailer, but we still provide face-to-face customer service and maintenance, which is something that large online retailers do not offer. When shopping for wholesale engagement rings, Inter-Continental Jewelers is the best choice as an affordable option that does not compromise quality. 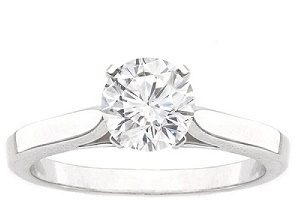 Inter-Continental Jewelers offers a wide and beautiful selection of affordable engagement ring settings and certified loose diamonds, including GIA, EGL USA, and AGS certified diamonds. We at Inter-Continental Jewelers are confident that we can find you the best, quality diamonds within your budget while you experience the utmost superior customer service. Stop by our showroom today or shop online to see why we are one of the best jewelry stores in Houston! Please feel free to call us at (713) 785-9600 or contact us via e-mail at [email protected], and we'll be happy to assist you in finding the perfect engagement ring!